Fall has finally arrived. 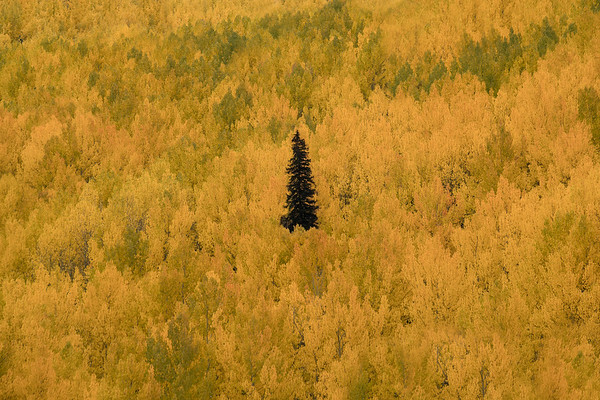 People from all around the United States and the world are gathering to see the changing of the autumn colors in Colorado. 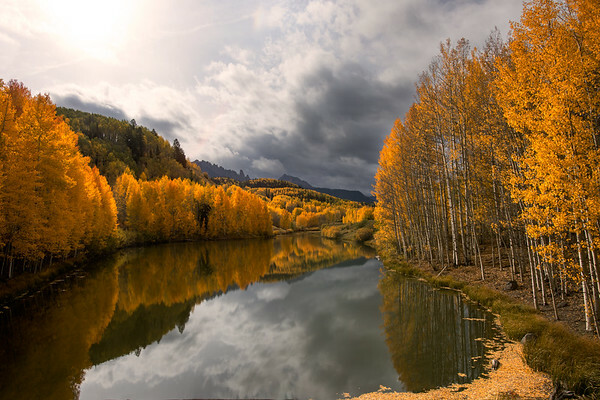 Colorado might be one of the best places in the world to see fall colors with an abundance of huge golden aspen groves. I’m lucky enough to live in such a beautiful state so close to such amazing photo locations. I’ve spent the past couple falls to explore my own state and attempt to capture the beauty of Colorado in the fall. This year was no different as I found myself once again heading down to Southwest Colorado in search of color for a couple of days. 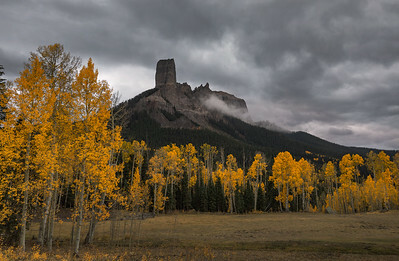 My first morning out photographing, I headed on a small county road to photograph Mears Peak. It’s a spot that I had scouted before on previous trips in the area. It’s a nice spot with a beautiful view of a ridge filled with fall colors leading to the amazing peaks of the Sneffels range. The morning’s sunrise was looking bleak as the sky was filled with dark overcast clouds. As I set up the tripod and photographed the view, while the clouds made for a dramatic and moody image. As I was photographing the ridge I could see a cloud of rain approaching fast. Once it reached us, I packed up my stuff headed for my car. I wasn’t terribly happy with the shot I got and the sky was beginning to open up to the east so I waited in my car. As I was about to leave, the sky above the mountains began to clear up but just as quickly it cleared up, another dark cloud of rain appeared and was approaching once again. I didn’t want to get rained on again so I hopped in my car and headed out. As I was leaving I noticed that a rainbow had appeared above the mountains. I parked my car as quickly as possible and ran over to the view to quickly grab a shot as the rainbow was fading away. I’m happy that I stayed as long as I did and was able to capture an image I’m happy with. 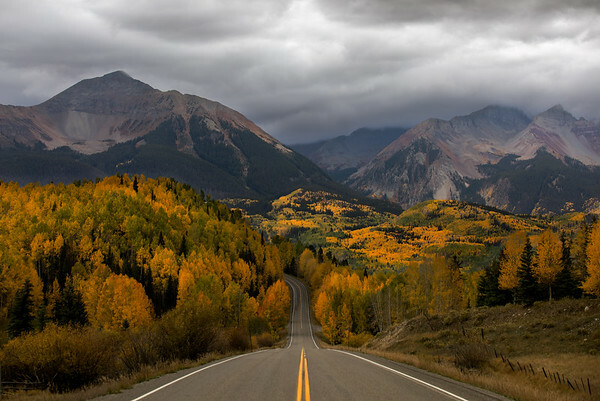 I headed out on the road toward Telluride, Colorado. 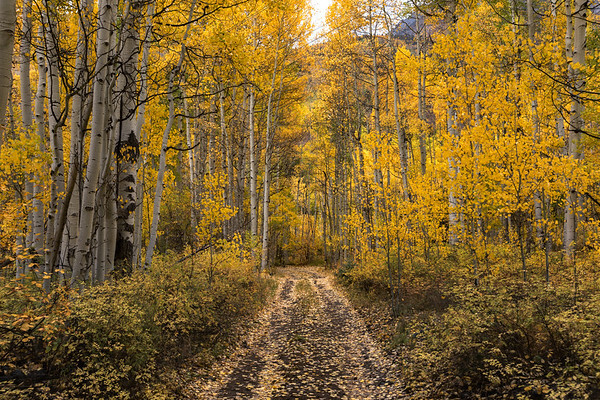 The drives in southwest Colorado during the fall are stunning, with views all around. It’s hard not to stop every five minutes and take a pictures. One of the places I stopped along the way was at Cushman Lake. The sun was just starting to peak through the clouds lighting up the aspens around the lake. The water was surprisingly calm, creating a perfect reflection. After the quick stop I headed to my next photo location. 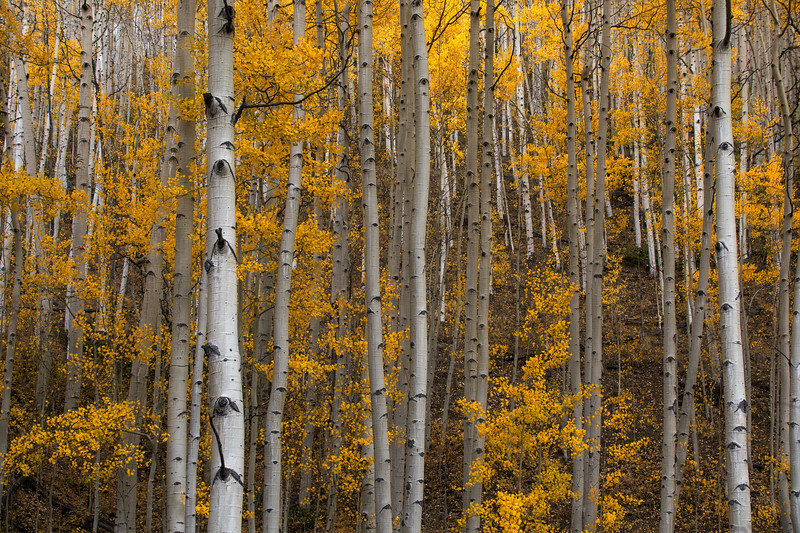 As I was driving up Ophir Pass I saw the grove of twisted aspens. 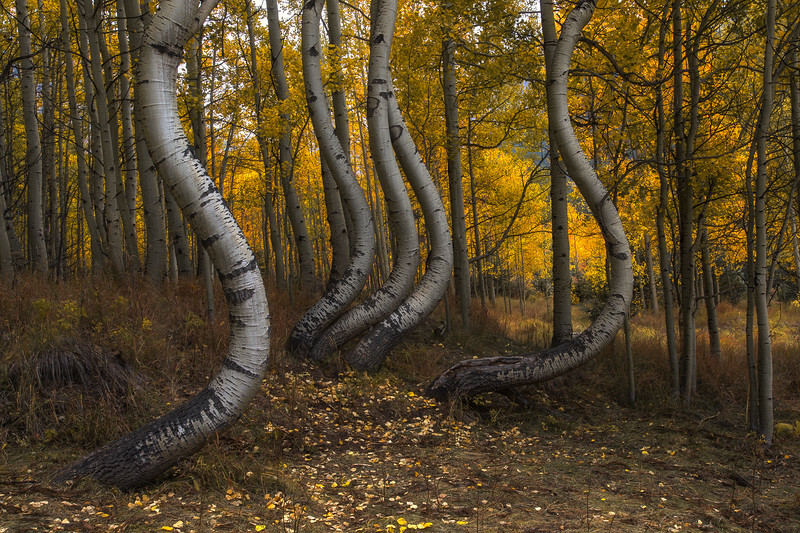 This grove is pretty popular among photographers for the unique shape of the aspens. Ever since I saw images of them I’ve wanted to photograph it for myself. I’ve searched for the last couple of times I’ve been in the area with no luck. I reached out to a couple of local photographers who were able to help me find them this year. Even if the picture isn’t that unique, the grove were pretty exciting to see in person. The next place I visited was another off the beaten path spot that’s popular among photographers. 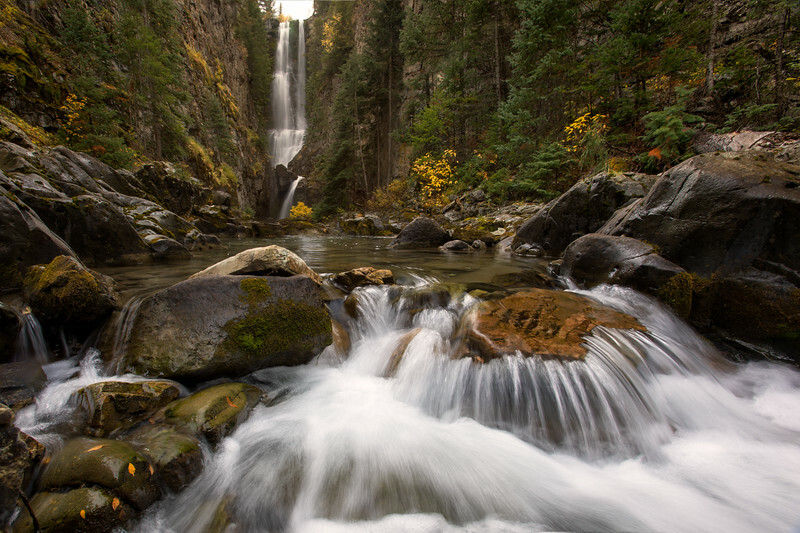 Mystic falls is one of the most impressive waterfalls I’ve seen in Colorado. It’s also fairly unknown, which is great. I only ran into a couple of people on the trail. The trail itself was pretty hard to follow. I got lost a couple times but eventually found my way to the falls. 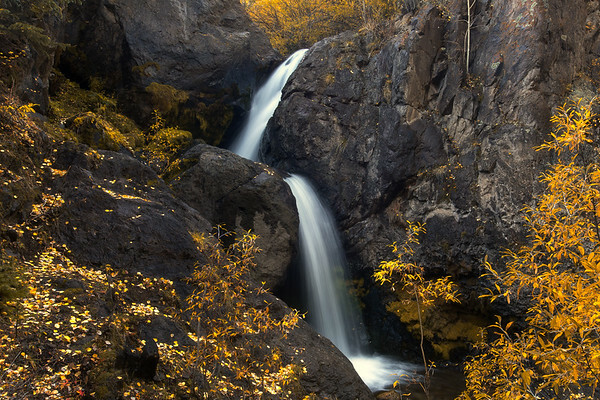 The waterfall is huge and leads into a creek surrounded by rocky walls on both sides. It’s an extremely photogenic waterfall with lots of foreground options. The composition I liked the best for this image was of this one spot on the stream where the water fell over a couple mossy rocks, leading to the waterfall. I chose a long exposure, but didn’t want to go to long, so that there was still lots of detail in the stream. Overall, seeing this waterfall was one of the highlights of my trip, and I was happy to come away with a unique photograph of the falls. 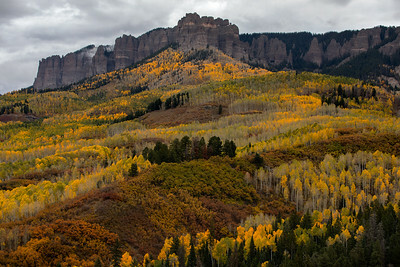 The final spot I had planned to photograph for the day was at the top of Owl Creek Pass. I had photographed this spot before but was never really that happy with what I captured. Last time I was here, I had hoped for a colorful sky above Courthouse Mountain but only got dark overcast clouds. Once again this year the sky was very overcast. 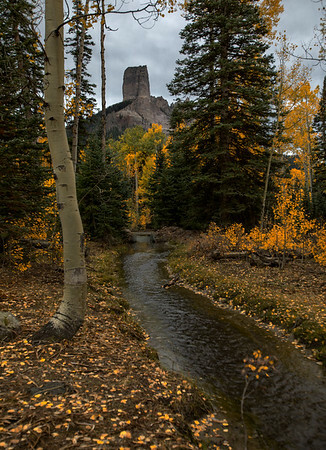 There is a spot that you can hike to above the pass and onto a ridge with a stunning expansive view of aspens. I’ve tried to find this spot before but have failed each time I’ve looked for where to start the hike. This year I was running a little late and the sunset was not looking promising so I decided to just photograph from the side of the road like I did the year before. Unfortunately as time passed, it became clear that there would be no light that night so I headed out and off to sleep. On my way to Owl Creek Pass the views around the drive were stunning. I was able to find an image that I had been looking for the entire trip. 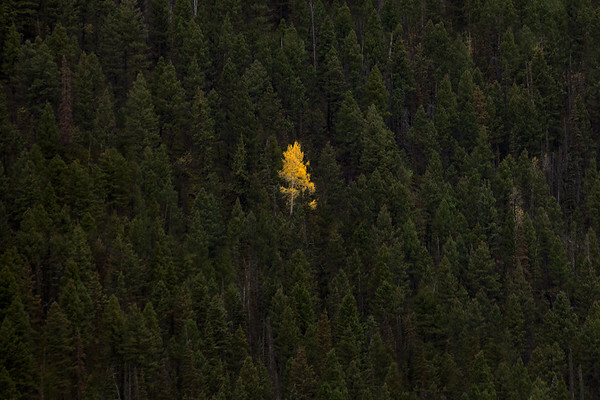 Earlier in the day I photographed a lone aspen tree surrounded by pine trees on the side of the road. 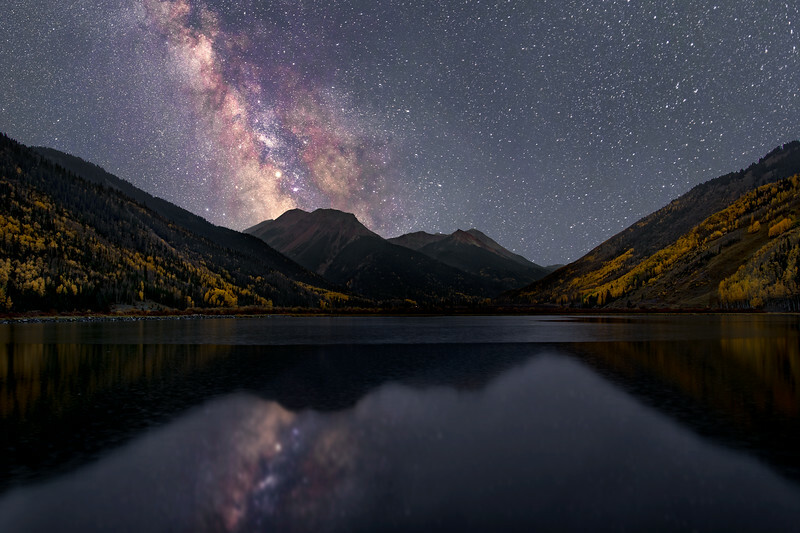 It’s a really nice image, but I had been searching for an image to go along with it and that was a forest of aspens, with one pine tree in the center. 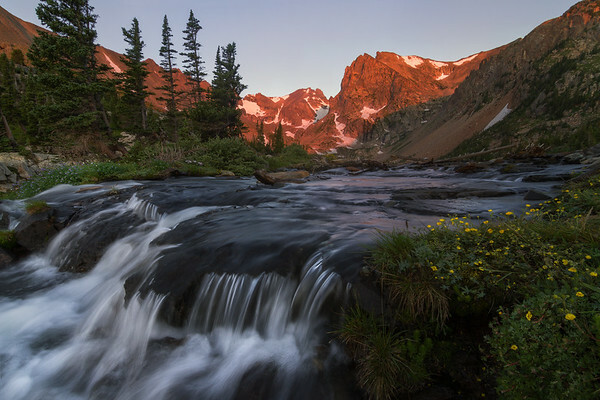 Thankfully, on Owl Creek Pass I finally found the shot I was looking for. Both images are nice, but I really like the juxtaposition of both images together. The next morning I woke up early to the first glimpse of clear skies I had on the trip. I was excited since my plan was to do some star photography. I drove to Crystal Lake south of Ouray, Colorado. 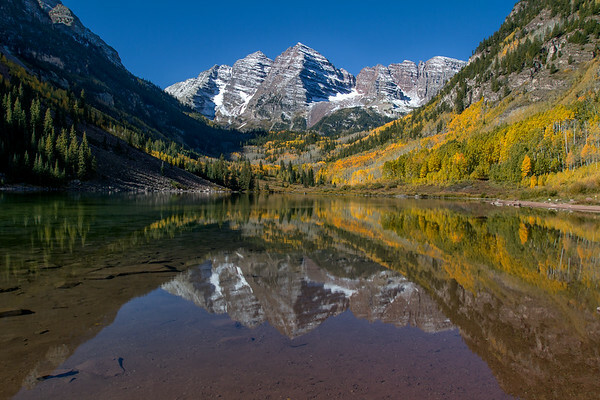 Crystal Lake is a really pretty small lake surrounded by hills of aspen forests leading to Red Mountain. When I got there early in the morning the galactic core of the Milky Way was framed perfectly above the mountain and the hills. It made for a really nice image and an awesome memory. Since there were no clouds in the sky, the chance of sunrise color wasn’t looking great so I headed off along the road. I stopped along the side of the road once more to photograph this small stream on the side of the road. It was a really pretty stream that had some small waterfalls. I managed to cross the stream while soaking my foot in the cold water. I really enjoyed the composition I ended upon. It shows the stream and the small waterfalls well, with some nice subtle fall colors in the background. It was a quick stop but the end photograph is another one that I’m satisfied with. 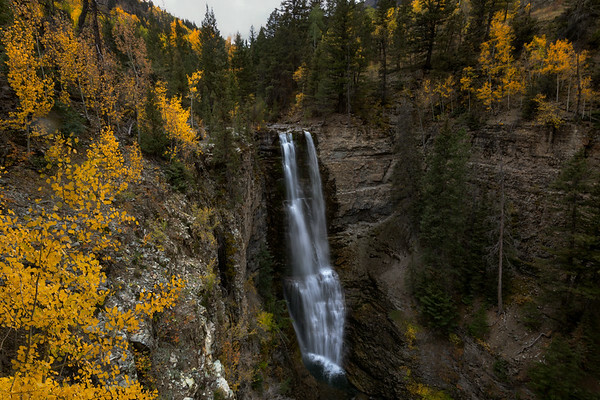 The last place I visited on this trip was Nellie Creek Falls outside of Lake City, Colorado. 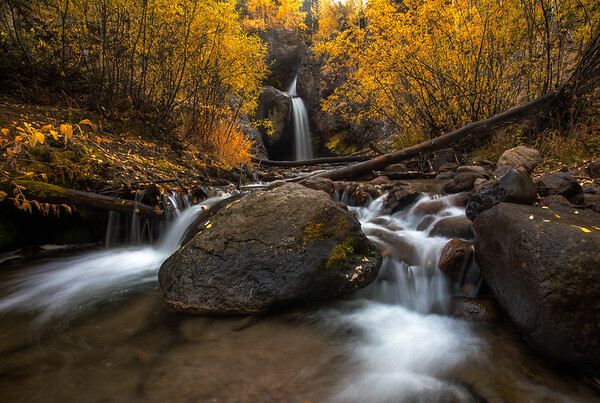 This small waterfall is an extremely photogenic spot with the tow tiered waterfall surrounded by a field of aspen trees. I had an image in mind, and worked hard to find a composition where the waterfall was framed by two aspen trunks on the sides. After I finally captured that image I headed down a small trail toward the base of the falls. I found another composition of the falls with the stream in the foreground. This was another small and unique photograph that I’m fond of. 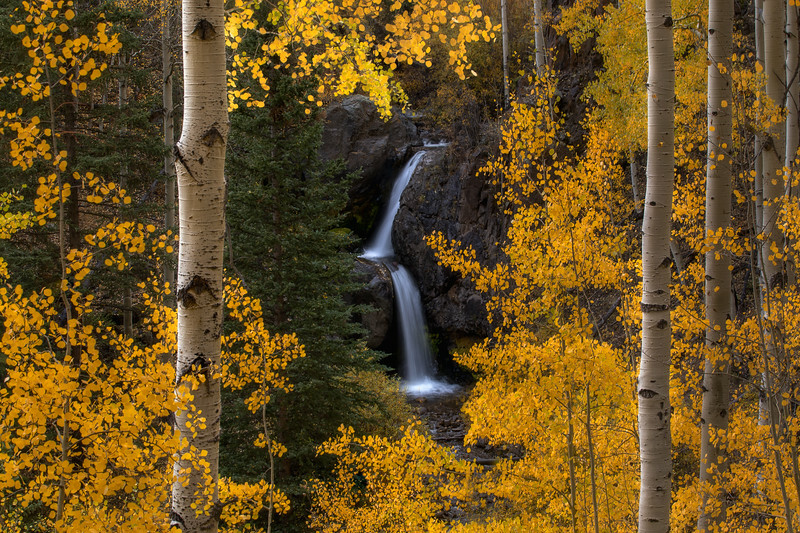 I was able to photograph a beautiful grove of aspens behind the falls as well. 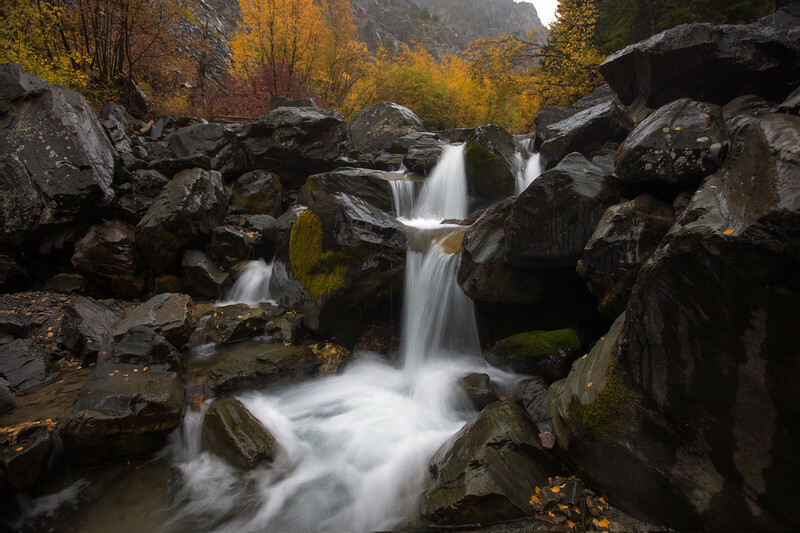 The area around Nellie Creek falls was stunning, and I was able to capture several photographs that I’m happy with. Overall this trip was a success. 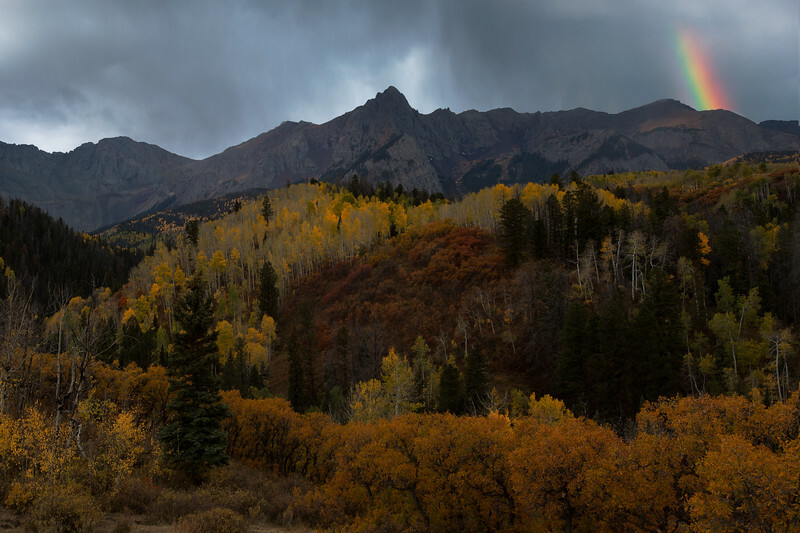 Any time I get to go out and photograph fall colors in the Colorado mountains is always great. There are endless photo opportunities of beautiful trees, valleys, mountains, and lakes. Even though I didn't get any epic light on this trip, I think i managed to capture a lot of solid images that i'm proud of. Most of the images I took on this trip are more small scale than i'm used to. Typically I shoot the biggest valley and mountains, while on this trip I tried to focus on more details and smaller scenes. This helped me create several unique images that help add to my portfolio.